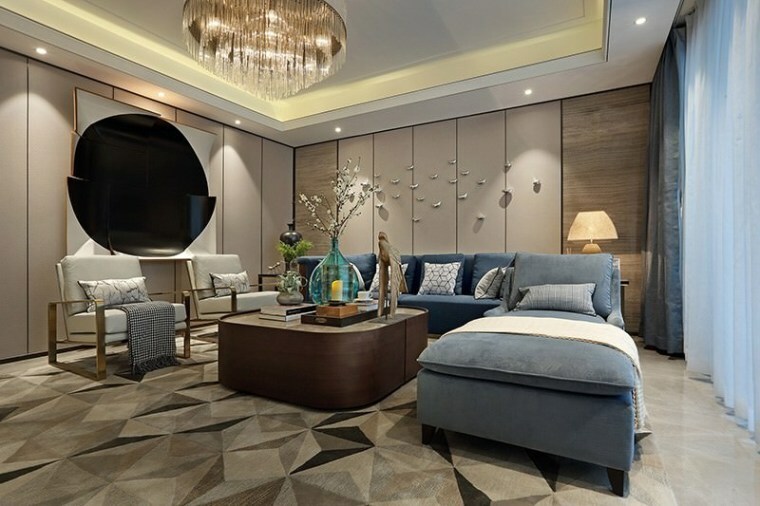 From the architect: When designing the overall living scene, the designer centres on elegant and comfortable furniture and matches brushed stainless steel decorations so as to enrich space hierarchy and texture, creating a French, high-end, luxury and romantic atmosphere. Stepping into the living room, low brightness main colours along with macaroon blue creates a comfortable visual experience. All the lamps adopted are fashionable in style. The transparent glass material and light shape of the main light make a higher visual sense of the living room. 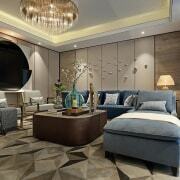 Furnishings with bright colours and simple lines are placed on the elegant grey rug. Against the background of abstract sandstone decorative picture in grey-blue hues, the space is exquisitely refined and elegant. 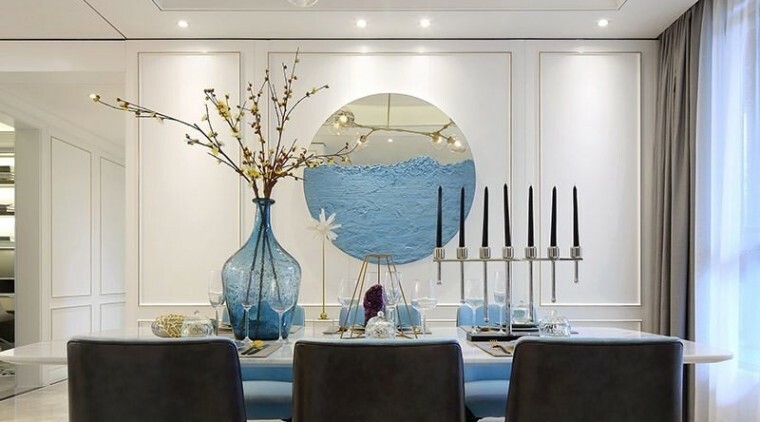 The dining room is connected with the living room, where the macaroon blue is added to the elegant main tone. Plus the free floral arrangement on the dining table, decorations strewn at random and the mirror sandstone decorative picture on the wall, all the elements are integrated to create a warm and elegant dining space with rich hierarchy. Open kitchen area is divided into different function spaces by a bar. White cabinets, black bar chairs and kitchen appliances, together with floor and walls in grey tone, make visual effects of black, white and grey, creating a clean and elegant atmosphere. 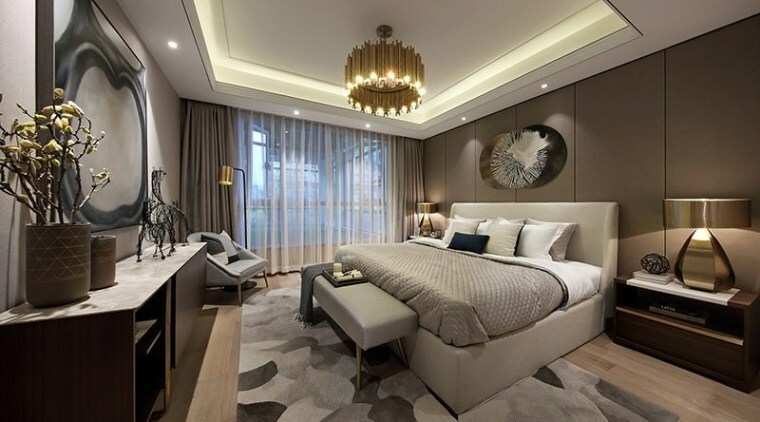 The master bedroom adopts the main colours of the living room, where well designed lamps emit soft lights and the bedding is warm and soft. Together with furniture and handmade artwork in simple lines, the space looks stylish and romantic. 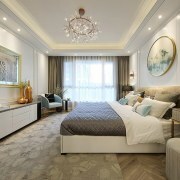 The parents' room is decorated in warm grey tones to create a serene and restful environment; while the boy's room is designed with Batman as the theme, which is well-suited to a boy's nature; the girl's room incorporates more macaroons as harmonising colours, along with the round bed, small chamfering wardrobe and cute bedding, creating a space full of children's naiveté and fun.